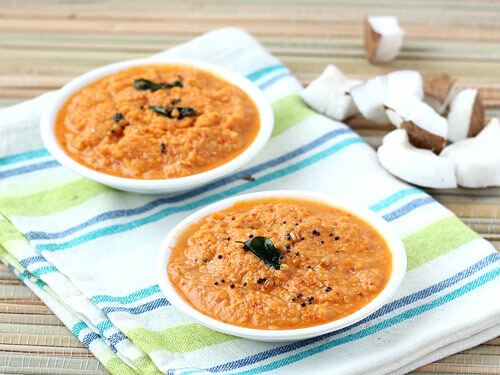 This Kerala style coconut chutney does not get its inviting red color only from red chillies but also from tomatoes, and this is what sets it apart from other south Indian chutneys as tomato provides a tempting tangy touch to its otherwise spicy taste. 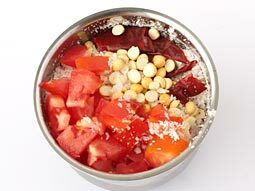 Take grated coconut, garlic, dry red chillies, roasted chana dal, chopped tomato and salt in a grinder or food processor. Pour 2 tablespoons water and grind until medium coarse paste. Taste for salt and add more if required. Add and mix water as needed to make it diluted to desired level. Transfer to a serving bowl. 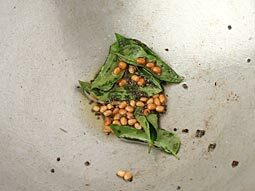 Heat oil in a small pan, add mustard seeds, urad dal and curry leaves (add dal and curry leaves when mustard seeds start to splutter). Sauté until dal turns golden brown. Remove pan from flame and immediately pour tempering over chutney. Mix if desired. 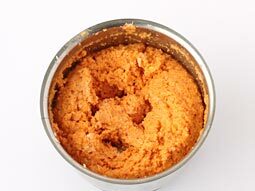 Kerala style red tomato coconut chutney is ready; serve it with idli, set dosa, appam, etc. Consume it fresh or you can store it in refrigerator for up to 3 days. 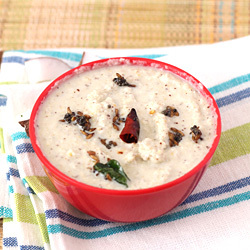 Serving Ideas: Serve this kerala coconut chutney with upma, uttapam and medu vada along with sambhar. It can also be served with bhajji, aloo bonda etc. Amazing! Tried it today... turned in to a delicious dish. Easy to make. Made it yesterday. Brilliant. Just perfect. Gone into my Recipe Book. Thank you.